Ribbon awards displayed in cluster according to their order of precedence and as required to be arranged on the Class A uniform. The Fraternal Order of Police, Lodge #7 has issued an additional award ribbon which has not been officially approved or assigned an order of precedence by the Chicago Police Department. It has been added to the ribbon cluster as an outside agency award. NOTE: The “Outside Governmental Agency Award” ribbon image is a placeholder representation. It is not of an actual ribbon. 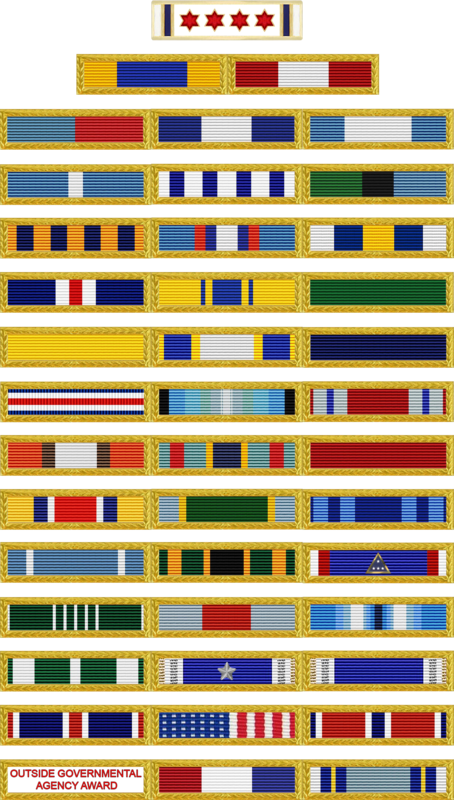 The ribbon bar representing the highest award shall be positioned to the wearer’s right, as demonstrated in the Ribbon Cluster above, with subsequent ribbon bars in descending order from right to left. A single ribbon bar will be positioned 1/4″ above and centered over the wearer’s nameplate and unit designator. Multiple ribbon bars shall be positioned end to end on the same horizontal line as the first ribbon bar. No more than three ribbons shall be assembled in any given row. Additional rows of ribbons shall be positioned 1/8″ above the previous row. Whenever there are fewer than three ribbon bars in any given row, they shall be centered over the nameplate or previous row of ribbon bars. Ribbon bars shall only be worn on the members outer garment, excluding rain wear and the pull-over sweater.